There is nothing more important than educating women - it is the one sure shot, consistent gauge of progress for practically every development indicator, from mortality declines to economic growth, democracy and justice, he said. "It is my great honour to be a part of this prestigious institution’s 13th Convocation. Today, the graduating students who have been conferred degrees, shall join a large and prominent group of global alumni of Jamia Hamdard based all across the globe. They should all be proud to be in the league of some eminent alumni who have made their mark in whichever field they chose to excel in. Jamia Hamdard is a unique institution conceived and built single- handedly by its decorated Founder. It has achieved tremendous respect among the public and among all stakeholders. I am pleased to learn that in a short span of 30 years, it has created a niche for itself. The Founder of the University Hakeem Abdul Hameed, who decided to stay in India during the turbulent days of the partition, nurtured the noble dream of building a University where higher education could be imparted to students from all sections of the society. His dream was a testament to his great patriotism and commitment to the nation and its people. He started his educational mission by establishing colleges imparting higher education in the fields of Pharmacy, Unani Medicine and Nursing. These colleges and other institutions were then amalgamated into a single unit within a University. The University was granted status of Deemed to be University as ‘Jamia Hamdard’ in the year 1989. Jamia Hamdard currently houses one of the pioneering Colleges in the field of Nursing education. I understand that there is a tough competition happening to obtain a seat in the prestigious Rufaida College of Nursing at Jamia Hamdard. I understand that Graduates and teachers of the Nursing College of Jamia Hamdard have won global recognitions for their committed service. Apart from nursing, Hakeem Sahib wanted to create educational avenues for girls in all disciplines. This has resulted in an exponential increase in girl student enrolment in Jamia Hamdard. It is extremely heartening to note that Hamdard currently has enrolment of almost 50% female students in its Hamdard programs. Educating girls of all sections of society, has been an area of great priority for the current government. There is nothing more important than educating women- it is the one sure shot, consistent gauge of progress for practically every development indicator, from mortality declines to economic growth, democracy and justice. 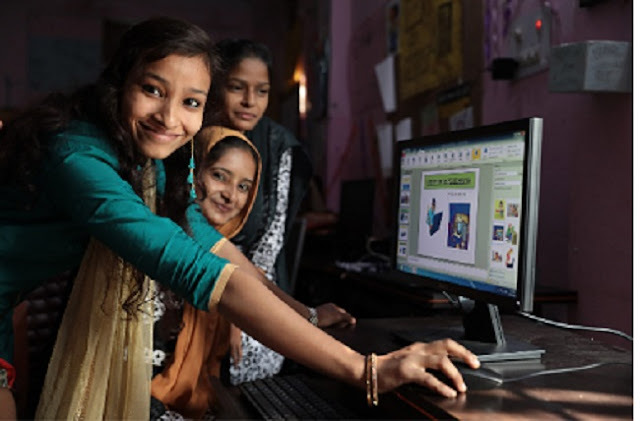 It is a matter of great concern that in India the average female literacy rate is 65.46%, while the world average female literacy rate is 79.7%. The World Bank estimates female labour force participation in the market at 31.2 percent in India and says that more than 50 million young women in India neither study nor work. The numbers are appalling. It is also calculated that one percentage point increase in female education raises the average gross domestic product (GDP) by 0.3 percentage points and raises annual GDP growth rates by 0.2 percentage points. A study in 2015 found that India could increase its GDP by 16-60% by 2025 by simply enabling women to participate in the economy at par with men. A tremendous opportunity for progress lies in women’s education and empowerment. Programs like ‘Beti Bachao – Beti Padhao’, ‘Sukanya Samriddhi Yojana’ etc have been proven to be ‘game changers’ and have inspired people to campaign for the cause of the girl child. Like ‘Swachh Bharat’ became a mass movement, empowering the girl child should also become a mass movement, a cause close to the hearts of every Indian. It is upto institutions like this university to educate more women and inspire them to become a productive part of the work force which would soon become India’s claim to fame, given its huge youth population. I am being told that the rain water harvesting system at Jamia Hamdard is considered as a model for emulation by many. It reflects the commitment of this University towards protect the environment. Water is the most important natural resource without which life is simply not possible, it is the very basis of life. Rain water harvesting helps in mitigating the inadequacy of surface water and in recharging ground water levels. It is encouraging to note that Jamia Hardard is not only teaching its students the importance of conserving every drop of water, but also practicing it effectively, thereby acting as a role model in this respect to all other educational institutions. I am happy to know that Jamia Hamdard has reached high levels of excellence, particularly in the field of Pharmacy. But there is a need to further expand our research and development to produce new and better quality medicines and to tighten our drug testing and experiment protocols. It is heartening to note that Jamia Hamdard is perhaps one of the few Universities where education and research are conducted both in modern medicine as well as traditional medicine, all within one campus. Convergence of modern and traditional knowledge and thoughts are important for the growth of our country where these practices have co-existed for centuries. India has a great potential to assimilate different thoughts and knowledge and this ‘Sangam’ is very prominently showcased in case of ‘Ayurveda’ and ‘Unani’ which are two systems of medicine having a lot of similarities but with certain differences. Unani medicine is one of components of AYUSH. AYUSH medicines have great potential as they are considered safe and nature inspired. The Government is promoting AYUSH in a big way, an independent Ministry has been created to deal specifically with issues related to AYUSH medications. Keeping both physical and mental wellness of people in mind, the Government has been promoting holistic health practices like Yoga. Yoga Day, which falls on 21st June is now a much celebrated event in India and all over the world. While promoting traditional, natural systems of medicine, an attempt should also be made to prove the efficacy of these systems using globally established experimentation protocols. There can be no place better than Jamia Hamdard for such a convergence where traditional medicine can be validated and standardized using modern tools and techniques of pharmacy, biochemistry, toxicology and clinical practices. It is heartening to note that all the necessary infrastructure for such studies is currently available on the Jamia Hamdard campus. I urge the students and researchers to exploit this unique opportunity of learning and expand their horizon of knowledge and experience. It would be a great service to mankind if the boundless knowledge and wisdom that our traditional medical systems possess can be meticulously validated and documented for the posterity. Friends, India is now on the verge of a demographic dividend. 65% of India’s population is under 35 years of age. There is a huge potential for growth and development within India’s young human resource. But for the youth of India to be a productive workforce, quality education and excellent skill development practices are a necessary precondition. The Government has initiated many steps to bring quality to educational institutions. NIRF which was launched in 2016 is now a globally recognized ranking system. Each year, several higher education institutions are coming forward to receive evaluations and feedback and work towards achieving best possible rankings for their facilities and resources. Both parents and prospective students are also more conscious about ranking and rating of the institutions. Greater awareness among the general population will help eliminate existence of institutions which use false information to attract students. Some other initiatives of Government such as the National Academic Depository (NAD) have had a tremendous impact in the life of students. Now students do not need to visit their Universities to get their degrees and awards verified. Students can now go online, and with a click of button through the NAD portal, their degree and award can be verified. In addition,Massive Open Online Courses (MOOCs) and E-pathshala are other programmes which have further created different benefit of students. Dear Graduates, today is a very important day for you, for this academic institution and for your parents and loved ones. May this day serve as a turning point in your lives. You are moving away from the protected environment of your university and from the circle of love cast around you by the constant presence of your parents. You are moving into a world where you have to find your own footing, write your own story and fight your own battles. The institution can only do so much, it can only prepare you to fight. But it is your hands that have to wield the sword and carry the shield, it is your mind that has to strategise and it is your moral compass that has to lead you forward. Dedicate your lives to improving the plight of the less fortunate around you. Do not let technology and gadgets overtake people and relationships, especially those in the medical profession. Always respond sensibly, sensitively, reservedly and mildly to people who come to you suffering from ailments of the mind, body and spirit. Always be kind, for there is no virtue like kindness. Tomorrow you would step out of the hallowed portals of this institution and join the mission of nation building. A great responsibility rests upon your shoulders. Our nation faces a number of challenges from crippling poverty to violence to discrimination and illiteracy to environmental degradation. It is upto you to combat these great challenges of our times. The faith of the nation rests upon you. Every one of you is worthy of that faith. This nation needs able, visionary leaders. When you choose your leaders make sure that they possess 4 Cs, Character, Calibre, Capacity and Conduct. Unfortunately, 3 other Cs are assuming great importance today, Caste, Community and Cash. I hope that each one of you will be leaders of impeccable character, boundless calibre, great capacity and spotless conduct. I hope that you live upto the great expectations that the nation has about you. The world is now truly a global village and you are all ready to take a global journey. Each step you take in the right direction will make you, your family, and your nation proud. The University expects you to remain worthy of the degree that is being conferred upon you today, forever and become ambassadors of your alma mater. Congratulations! And my best wishes for your continued success and a bright career ahead!